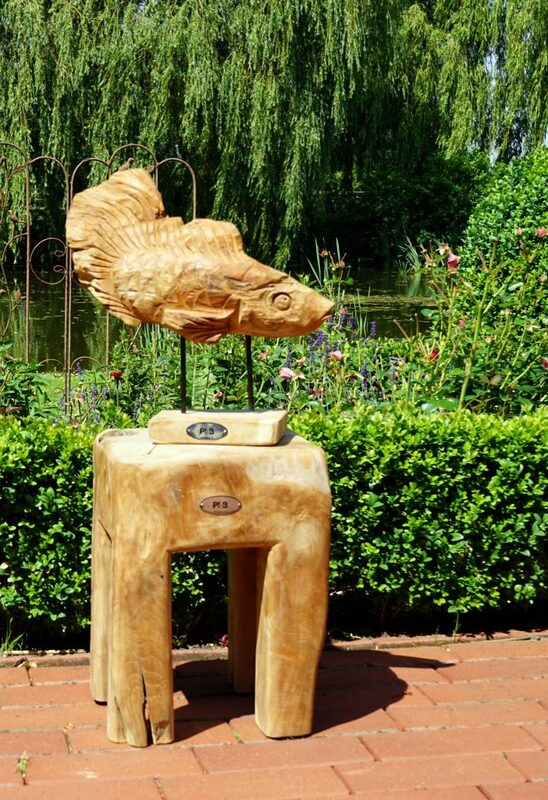 Decorative items made from teak roots are a real eye-catcher, both indoors and out. They are made from the rootwood of the teak tree. In addition to using the roots in their natural form as imaginative decorations, they can also be carved into works of art like the 2-metre statues. Painstakingly crafted by hand, masters of their art incorporate the shape of the decorative item into the inherent form of the root. Because they retain their natural shape, such decorative elements blend harmoniously into their surroundings. Decorative figurines are prominently placed on wooden pedestals. The combination of the powder-coated iron rod and the strong teak wood stands for robustness and longevity, and if necessary can withstand all weather conditions all year round. Each item is unique and because of this can sometimes vary in size and shape. 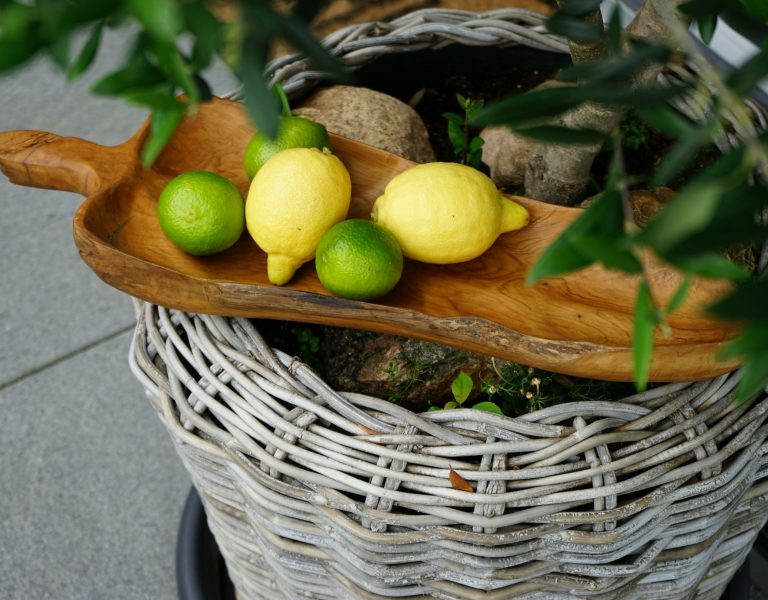 Our current product range includes many different decorative items which you can use to design and embellish your garden to your personal taste. When choosing our products, we pay special attention to top quality and suitable materials. Our range includes many different decorative items, such as figurines, bowls or orbs, all of which can become striking features in your garden. With new garden decorations, you can redesign your garden in next to no time and give it a completely new atmosphere, encouraging visitors to feel at home and relax. 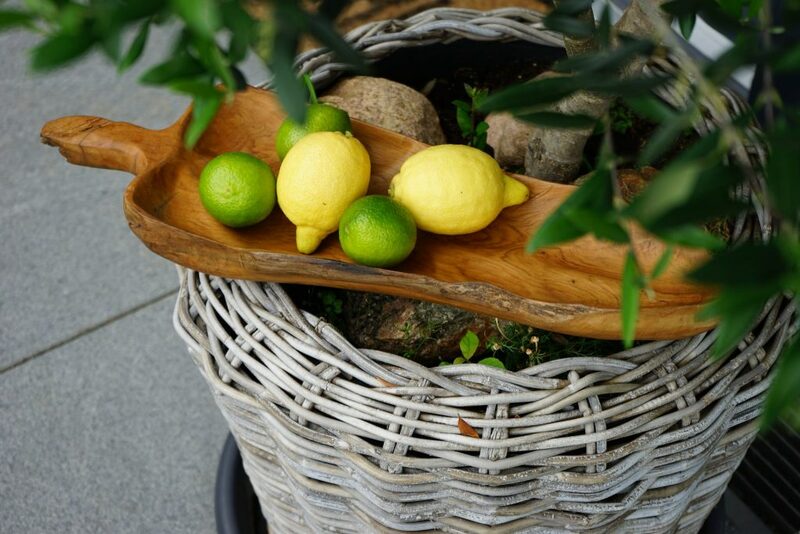 Garden decorations made of wood are suitable, for example, to give your garden a Mediterranean look. Combined with bright colours, they become real eye-catchers that will grab people’s attention. Decorative items can not only beautify gardens – they also look great on balconies and terraces. Scrub teak-deco with Ploß® „Holzentgrauer“ from time to time. With all our products, we pay particular attention to ensure that we only use top-quality materials. We only use certified wood from Indonesia, which is particularly robust and resilient. It is hardly affected by wind and weather, so that the decorative items can also remain outside in the rain and cold, without suffering from the weather conditions. Over time, decorative items made of teak develop a silver-grey patina, which blends into the surrounding foliage even better. In our catalogue, you will find a wide selection of many different decorative items. The range of decorative bowls is particularly large, being available in many different shapes and sizes, so that they can be used for all sorts of purposes. They are, for example, suitable for storing things in that you use in the garden, such as your sunglasses or decorative garden accessories. You might also want to fill the bowls with flowers, leaves or small pebbles. 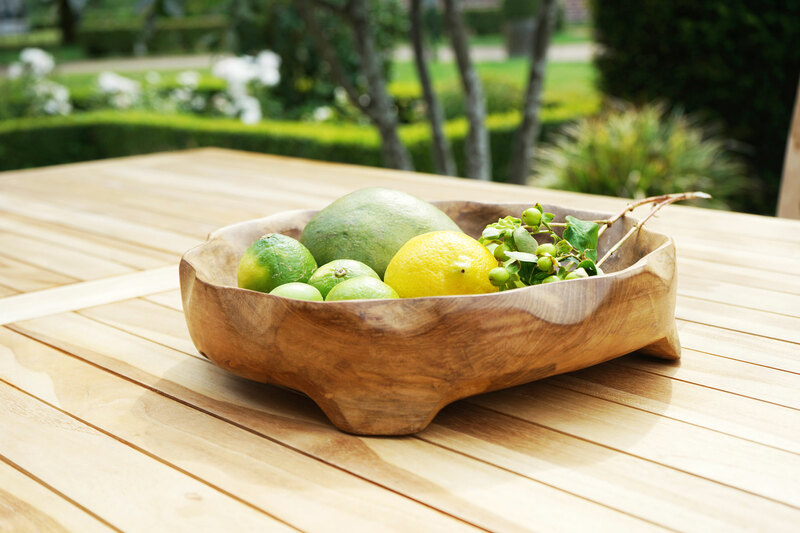 Many bowls have a striking design and will capture people’s attention when you place them in your garden. Filled with holiday mementoes or garden treasures, they might also serve as an eye-catcher on the dining table, where they fulfil a useful purpose at the same time. Particularly the boat-shaped bowls are likely to attract people’s attention. Their striking elongated tapered design is very elegant. These bowls can easily be combined with other articles, such as seashells or sand, to produce a light, coastal flair. 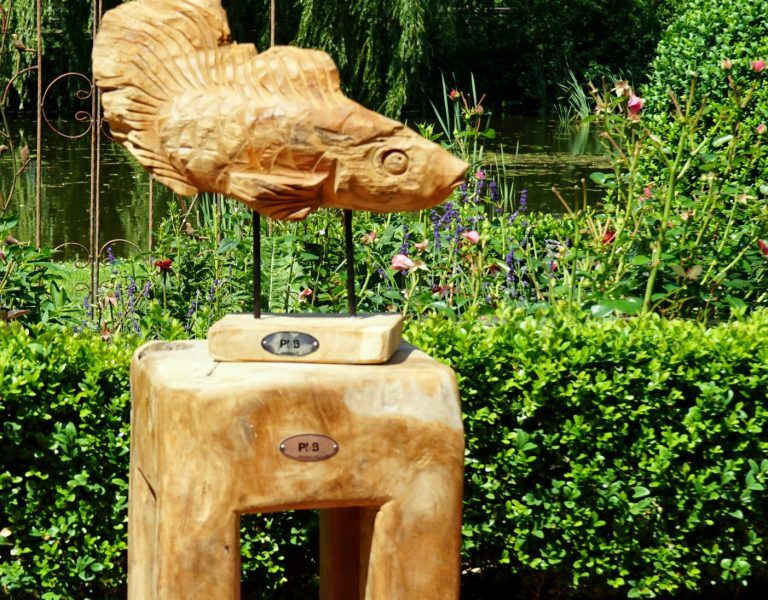 They are nicely complemented by fishing nets or seagull figurines, which can round off the overall look of your garden. Our catalogue also contains some very unusual decorative items, such as a vase made of pure Indonesian quality wood. You could fill it with flowers, turning it into a real eye-catcher. Since the vase is made of robust wood, you can use it indoors as well as out. Alternatively, the vase can also be used as a decoration and as such adorn your garden or terrace. We also have a fetching wooden stool to go with it. You can sit on it or use it as a decorative element. It too is made of resilient teak wood and can be left outdoors when it rains. In our catalogue you will also find many different animal figurines, such as penguins, an eagle and special fish. Beyond this, it contains many high-quality statues, unusual orbs and small works of art from our product range. 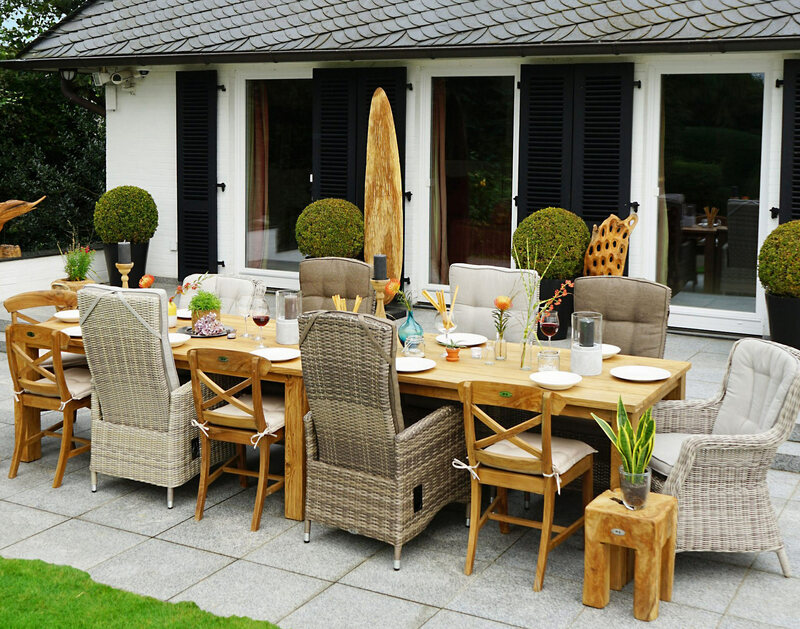 Thanks to the excellent quality of our products, they can remain outside all year round. Take a look at our complete catalogue and your search for the right decorative items for your garden will be over at last.